You bought it… Let me show you how to use it! What is “The Cloud” and Why Do I Need It? The term “The Cloud” has evolved from a tech industry buzzword into an everyday tool. Even if you don’t know what it means, you’ve probably still used it in at least one form. For example, if you’ve checked email using a web browser like Chrome, or if you’ve uploaded photos to share in an online album with Snapfish, or if you’ve streamed music with Pandora instead of playing CDs in your car or on your home stereo, then you’ve dabbled in the cloud. So what exactly is “The Cloud”? If you want to follow the metaphor, picture data living not only on your computer’s hard drive or on your mobile device, but also, in the sky above, ready for you to access from anywhere. Based on these notions of above and below, the terms “upload” and “download” become more clear. Uploading means taking data from your device and putting it into the cloud, while downloading is the exact opposite. If you want to get more technical, however, “The Cloud” actually refers to big rooms of computers that are owned by a variety of companies and are filled with many different types of files that you can access over the internet. How Many Clouds Are There? A common misconception is that there is one universal “Cloud”. In fact, there are many clouds managed by different companies. For example, Apple’s cloud (called iCloud) is a different cloud than Google’s cloud which is different than Dropbox’s cloud. As these clouds are not linked together, you will not necessarily have the same login names or passwords to access them — this is much like if you owned multiple houses, you would have different keys and different locks to open the front doors! If you’ve used the same password across all of your accounts, and someone figures it out, you run the risk of negative repercussions. Would you ever consider having just one key that could unlock all of your houses, cars, and safety deposit boxes? To maximize security, each account password should be distinct — and if you need help figuring out which password applies where, or want a better strategy for remembering your passwords, I’m here to help. What Can the Cloud Store? Different cloud services handle different types of data. Examples of data types include: email, contacts, calendars, documents, photos, music, apps, and books.There is no “one size fits all” solution to store all of your information, so it’s important to compare and contrast. For example, with Google, you get a huge inbox for email, plus the ability to store your contacts, update your calendars, and collaborate with others on documents and spreadsheets. With Apple’s iCloud, you have similar functionality to Google, but you can also find your iPhone or iPad if either is lost. Apple also saves a record of all of the music and apps you’ve bought so that you can download them on your various iDevices. Dropbox allows you to store various types of documents, music files, and photos automatically uploaded from your phone. When you buy a Kindle book with Amazon, it’s accessible anywhere. These are just a few examples of data you can store in the different clouds. Where’s My Stuff in the Cloud? As mentioned above, the term “cloud” may bring up some fanciful imagery but the reality is that uploaded data and files live on the computer hardware of various companies at locations called data centers. When your data is stored by professionals, they do everything in their power not to lose it — backups, redundancies, hacker-protection, and more are par for the course. 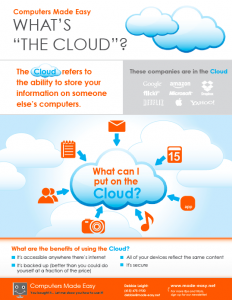 Because the cloud can be utilized in so many different ways, its benefits are nearly limitless. Whatever your data concerns are (backup, photo sharing, email, movies and music), the cloud gives you the means to access your information via any internet connection without fear of losing everything if your phone, tablet, or computer breaks. In most cases, it also allows your different devices to sync up while maintaining data security. Safe, simple, and convenient, perhaps the only stumbling block is keeping track of all those cloud accounts — but with a little organization, that falls into place too. With so many options for cloud storage, how do you keep organized? How do you make sure you’re using the right username and password for the right account? Get your cloud accounts organized now by downloading my free cheat sheet here. Areas served: Marin, San Francisco, and other Bay Area locations.